Britain’s successes under the Treaty of Paris (1783) translated into wholesale control of North America. Notwithstanding western Louisiana — an area of much more concern to Spain than to Britain — everything north of the Rio Grande was now nominally British. There was, however, no time allowed for celebrations. There existed a critical difference between the approach taken by the French and that adopted by the British when it came to outposts in the Pays d’en Haut. The French approached the building of forts and trading posts as guests in the lands of others; the British viewed places like Detroit as an asset that had fallen to them as part of the spoils of war. It was their possession, and not a place deep in Aboriginal territory. For that matter, the Native population, the British believed, were every bit as conquered as their defeated French allies. As the British repopulated the French outposts this attitude quickly poisoned relations with the indigenous peoples. As well, the giving of gifts observed annually by the French was, for the Aboriginal nations involved, a means of building up the status and thus the influence of Aboriginal leaders. The British misread this convention as the issuing of bribes which, they believed, was no longer necessary with the French out of the way. They failed to follow, as well, the French practice of “covering deaths” with gifts, a way of recognizing the loss of life among allied Aboriginal nations. Not surprisingly, the British soon wore out their welcome. 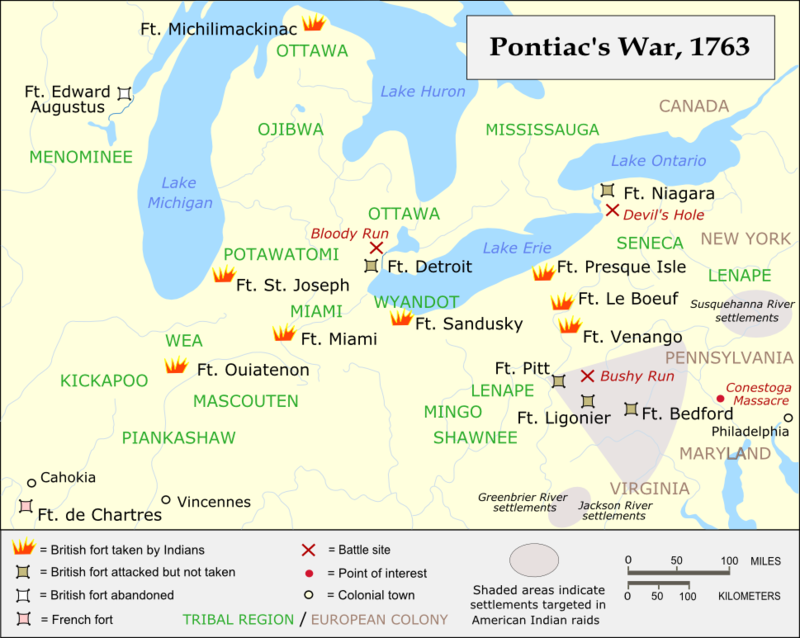 Pontiac’s War is the name given to a long-running series of conflicts in the Ohio and Great Lakes region that stemmed from the British takeover. Despite the name, it was not all masterminded or executed by Pontiac, an Odawa (Ottawa) leader (although that is how it was portrayed in textbooks for more than a century). The conflict had its roots in British American expansion into the region, which was a key reason for Aboriginal alliances with the French in the Seven Years’ War. Of course, not all Aboriginal peoples signed on with the French. The Haudenosaunee, the Shawnee, the Seneca/Mingo, and 10 other Aboriginal nations signed the Treaty of Easton in 1758, along with representatives from Pennsylvania and New Jersey. Under this agreement the British and their colonies relinquished land in the Ohio Valley to its Aboriginal owners and financially compensated the Lenape (Delaware) for their loss of lands in New Jersey. In exchange, the Aboriginal signatories agreed not to side with the French in the war. In short, the Treaty of Easton recognized aboriginal title and committed the British and Americans to respect it in the Ohio Valley. Even before the Seven Years’ War was over, however, British American settlement in the Ohio Valley was underway and the terms of the Treaty of Easton seemingly ignored. Nations that had been allied to the British found themselves at odds with their erstwhile partners, but were at a loss as to how to shift the balance back. The French were a spent force after 1760, a fact that was confirmed in the Treaty of Paris in 1763. An alliance of Aboriginal parties that had hitherto been in conflict seemed the only solution. Figure 7.1 Battle sites in Pontiac’s War. Attacks on British American positions began as early as February 1763, before the Treaty of Paris had been signed. There was, in other words, no post-war period of peace in the Ohio: war continued with few breaks from before 1754 to about 1766. The Seneca broke ranks with the Haudenosaunee to join in the rising that also included the Council of the Three Fires (Odawa, Ojibwa, Potawatomi, Wendat, and others) and the peoples of the Ohio most directly affected. Intellectual and spiritual leadership was provided by Neolin the Prophet, a Lenape (Delaware) visionary whose call to reject Euro-American materialism, alcohol, and ways of living had an enormous appeal and influenced Pontiac and other 18th and 19th century resistance movements. Ready for change, the Ohioans found a field general in Pontiac, whose forces attacked and laid siege (unsuccessfully) to the British at Fort Detroit. The war spread quickly across the region as others, inspired spiritually and militarily, took up arms. It was at Fort Pitt in late July 1763 that one of the most ominous chapters in North American conflict occurred. General Jeffrey Amherst (1717-1797) had badly underestimated anti-British feeling in the West and had, as a consequence, under-supplied the region with soldiers. Small forts containing only a few hundred troops and as many civilians were being reduced to ash, their commanders humiliated and then tortured to death. Amherst sent a message to Colonel Henry Bouquet, who was en route to Fort Pitt, directing him to try biological warfare as a solution: “Could it not be contrived to send the small pox among the disaffected tribes of Indians? We must on this occasion use every stratagem in our power to reduce them.” Amherst had already articulated a take-no-prisoners position, and he viewed the Aboriginal warriors as unworthy of the respect he would accord to a “civilized” nation’s army. Soon after he wrote to Bouquet: “You will Do well to try to Innoculate the Indians by means of Blankets, as well as to try Every other method that can serve to Extirpate this Execrable Race.” At Fort Pitt Bouquet initiated talks with Aboriginal leaders, gifting them with blankets taken from the smallpox hospital. It is not clear whether the blankets mentioned by Amherst were responsible for a smallpox epidemic. It is, however, well known that smallpox was rampant throughout the field of battle during the Seven Years’ War and that Aboriginal communities continued to suffer terribly as a result. An ugly background noise to the colonial period, smallpox and its effects (death, disfigurement, blindness) were cited by Neolin as cause to push the British Americans out of the Ohio. Smallpox was evident after Fort Pitt, but we cannot be sure whether it was caused by Bouquet and his blankets. 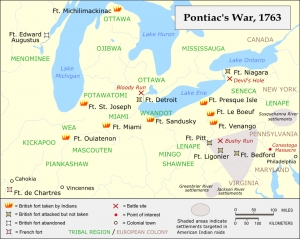 Regardless, smallpox probably did play a role in stopping Pontiac’s War. By 1767 treaties had been signed across the region, mostly by the people who were not immediately at the sharp edge of British-American expansion. Historians have observed that this conflict, one of the bloodiest in a long series of very bloody confrontations, was the first in which both sides embraced a policy of, for all intents and purposes, “ethnic cleansing.” As historian Daniel Richter has observed, from the time of Pontiac on, Aboriginal peoples viewed all Europeans and Americans as “whites” and the Euro-Americans viewed the multitude of Aboriginal nations as, simply, “Indians.” This attitude produced levels of intolerance that infected the century to come and beyond. Partly in response to the terrors of the Ohio Valley, the British government crafted the Royal Proclamation, which it passed on October 7, 1763. The decree was principally a guideline for the governance of North America after the Treaty of Paris. It created the Province of Quebec as a separate colonial unit consisting roughly of the lands draining into the St. Lawrence, from Detroit east to the Gaspé. Quebec was thus cut off from the Ohio Valley and the western frontier of the former New France. Provisions were included in the decree for the imposition of English civil law, but the French civil law, the Coutume de Paris, survived. The British promised their French Catholic subjects that they would not be deported, nor would their religion face persecution. Catholics, however, were not permitted to hold office of any kind (as was the rule in Britain). The Catholic clergy endured as well under the decree, although their numbers were reduced by death and emigration to France after the peace and they were not replenished. Governor James Murray (1721-1794) sought to use the clergy to his own ends, seeking by means of rewards and tolerance to secure their loyalty. He recognized their influence on the populace and was inclined to put plans for Protestantization on the back burner. Nonetheless, assimilation of the Canadiens was intended to be their fate just as expulsion was that of the Acadians. In the Ohio Valley the British sought to place a barrier between the two warring parties. They understood the source of friction to be American colonists’ appetite for land. By guaranteeing the Aboriginal nations that land title could be extinguished only by the authority of the Crown, the Royal Proclamation intended to put an end to unbridled settler expansionism. It was intended to buy peace and encourage trust among the Aboriginal nations, but it was also intended to restrain the American colonists who, the British realized, could prove very difficult to manage in the trans-Appalachian west. This was a feature of the Royal Proclamation that, of course, was strongly criticized by the American colonists. In summary, the British had fought to win Canada, but once it was theirs they began to realize what a challenge it was to govern. Having defeated the French, the British anticipated that there would be peace in the Pays d’en Haut; that proved not to be the case. The American colonists in particular were aggrieved: they had started the war with an incursion into the Ohio and that victory was meant to allow them westward expansion. Now the British — their imperial masters — were telling them to get back behind the Appalachians. Everywhere the British and their colonists turned, the triumphs at Louisbourg, Quebec, and the treaty table seemed hollow and pyrrhic. The end of the Seven Years’ War did not conclude the Aboriginal campaign to control European settlement and commerce in the Ohio Valley. The Treaty of Easton recognized Aboriginal title to land and other resources, an important precursor to similar provisions in the Royal Proclamation of 1763. British military conduct in the West included efforts to achieve victory through biological warfare. This marked a change in British attitudes toward Aboriginal peoples. The Royal Proclamation created the Province of Quebec, reassured the Canadiens, and protected Catholic rights while limiting Canadien-Catholic engagement in positions of authority. It addressed Aboriginal concerns by denying American settlers access to lands west of Appalachia. Pontiac’s war by Mahahahaneapneap is used under a CC-BY-SA 3.0 license. 7.2 Pyrrhic Victories by John Douglas Belshaw is licensed under a Creative Commons Attribution-NonCommercial-ShareAlike 4.0 International License, except where otherwise noted.